After studying finance in college and doing a few internships, Myra Adu-Sarkodie knew it wasn’t the field for her. She did a considerable amount of research to see what she was best suited for. One field came up repeatedly: massage therapy. She pondered the possibilities. “It’s a health care field. You’re helping people,” she said. 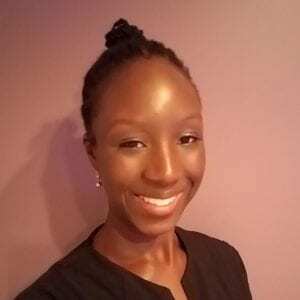 “You’re doing meaningful work, and you can really have a flexible schedule and build your own business.” Adu-Sarkodie began studying massage therapy at Florida Academy last July, and graduated in January 2018. “So far, I haven’t looked back. I love it!” she says. Adu-Sarkodie works at Spada part time and also has her own house-call massage business, Complete Cranial Relief. She specializes in head, neck and shoulder massage, but she does offer all kinds of services. “Since I have personally struggled with TMJ issues with the jaw, and because my mother is a dentist, I thought it would be great if I had that experience to help others with TMJ,” she says. Massage therapy can help with the pain of TMJ, tension headaches and migraines. “I love helping people unleash all that stress that causes these chronic problems,” Adu-Sarkodie says. Research has shown that massage can reduce anxiety, perceived pain, anger, intensity and duration of tension headaches, as well as migraines. Massage works on headaches by blocking pain signals, increasing circulation and releasing serotonin. The pressure and kneading through massage can relieve muscle spasms and decrease cortisol (the stress hormone), while increasing endorphins. Florida Academy, like other schools that offer massage therapy, teach only classic Swedish massage. “One thing the instructors always tried to do was to, at least, expose us to the deep tissue, pre-natal, hot stone, just so we’re prepared if we encounter those things when we’re at work,” she explains. Adu-Sarkodie says she has been practicing deep tissue techniques on her own time, researching through online videos. If you’re looking for an in-demand career, consider registering for the massage therapy program at Florida Academy. According to O*NET OnLine, the career outlook for massage therapists is much better than average. In Florida, the need for massage therapists is projected to increase by 29 percent through 2024. Contact Florida Academy today. New classes begin every six weeks.